Calculate deadlines directly from information in emails. 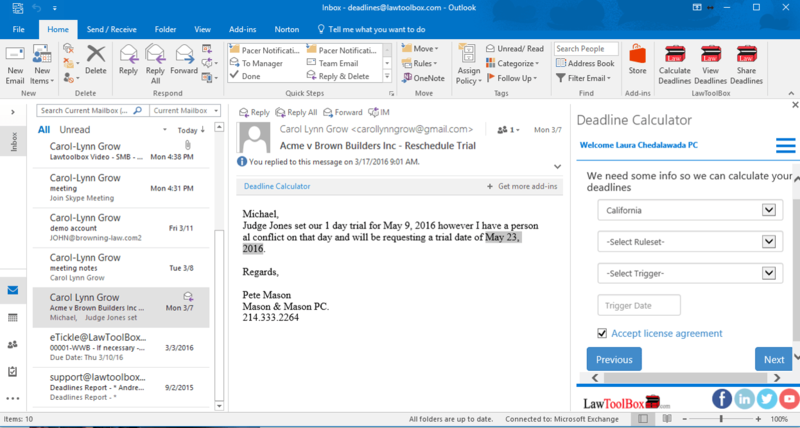 LawToolBox, the online, rules-based deadline calculator that I reviewed in some depth in 2013, today is announcing that its LawToolBox365 — which brings rules-based calendaring and matter-based deadlines directly into Microsoft Outlook — is now available to the legal market as part of a bundle with Microsoft Office 365. In partnership with Ingram Micro, the largest Microsoft Office 365 distributor in the U.S. and worldwide, LawToolBox365 is being offered as an add-on for legal, bundled into the Office 365 purchase process, as well as a la carte for firms that already have an Office 365 subscription. The bundle is available to law firms and corporate legal departments through authorized resellers. Resellers can purchase it through the Ingram Cloud Marketplace. LawToolBox will be the first company that sells exclusively to the legal market to be listed in the Cloud Marketplace’s legal vertical. Subscription packages are available for both law firms and legal departments, either as monthly or annual pre-paid subscriptions. The packages work with all versions of Office 365, except Office 365 Home editions. LawToolBox365 also works with Office 365 for iPad and Office 365 with Outlook on Mac (on premise and in the cloud). Although LawToolBox has long integrated with Outlook through an Office 365 app, the integration was one way, requiring all calculations and changes to be made through the LawToolBox website, after which the app would add the dates to the Outlook calendar. But recently, the company launched LawToolBox365, an add-in that creates a much more robust integration that resides entirely within Office 365. According to the company, 70 percent of law firms rely on Outlook to manage case deadlines. So enabling deadline calculations and calendaring directly within Outlook is significant. As I reported here in April, LawToolBox365 enables users to calculate, view and share deadlines directly within Outlook. One cool feature is the ability to calculate and recalculate deadlines directly from emails, including from PACER emails. Deadlines you calculate using this add-in are also added to your case-management system if it has two-way sync to Outlook. Calculate Deadlines. This button enables users to quickly calculate deadlines based on state and federal court rules for all 50 states. Select a state, a court rule set, and a trigger date and the deadlines are calculated and added to Outlook. Share Deadlines. This button permits a user to share case deadlines internally to Outlook calendars and externally to Google, Outlook, iCal and Lotus Notes calendars. View Deadlines. This button gives attorneys one-click access to deadline reports for their matters and gives law firms a centralized and matter-centric management system of deadlines, all within Outlook. When drafting an email, the attorney is able to pull up a deadline chart for a matter and insert all or selected deadlines into the email. The add-in also enables users to insert boilerplate language about calendar events directly into an email message. This is useful to insert standard language in an email to a client about a deposition or to opposing counsel about a meet and confer, for example. If a court’s deadline rules change for one of your matters, LawToolBox notifies you and can automatically recalculate all the deadlines. For resellers interested in learning more about the LawToolBox365 bundles, LawToolBox has added a resellers page to its website with information and links. To learn more about LawToolBox365 itself, visit this page. Below is a video that provides more information on LawToolBox365 bundled with Office 365. A separate video for resellers is available on the resellers’ page mentioned above.